This past weekend I took a break from schoolwork and went to IU to visit a few friends. The main highlight: Hoosier Hysteria all day on Saturday. I arrived to my buddy Alex’s dorm Friday evening and went with a few other people to a wing place called Buffa Louie’s. It was definitely a happening place. There were a few basketball players eating there. We were sitting two tables down from one of the senior players who is really talented. I felt like I was in the midst of a superstar. The wings were great and the atmosphere was awesome with all of the sports memorabilia. It is definitely a place to eat when in Bloomington. After that we were going to see Paranormal Activity 4 at the local theater, but a couple of the guys were saying how scary the movie Sinister was, so we went to see that instead. It was more freaky than scary. A few “jumpy” parts throughout and mainly just a sick movie. We went to bed late that night to the soothing sound of drunk students returning to the dorm. Saturday was a fairly early morning. We wanted to wake up early, get some breakfast, and get in line early so we could get some good seats for the presentation. And we did exactly that. We were in line at about 10am and the doors did not open until 4pm. There was about 150 to 200 people in line already that were in front of us. We had the best spot in line. So many events led up to the waiting in line being the worst part of the experience to one of the best parts. First, we had a hilarious group of people behind us that were true Hoosier fans and provided a bunch of laughs. Second, a van pulls up with a bunch of take-out boxes with food provided by a local restaurant with burgers and mozzarella cheese sticks. Those were SO good. They were also handing out free posters of the team. Third, Alex spotted a pro-baseball player who walked by and greeted him like he knew him. I honestly thought they did know each other. This guy just walks right next to us through the line. I mean, a millionaire within reach. Crazy to think about. Fourth, a Red Bull car comes and stops just a few yards away from the line and starts handing out free Red Bull to everyone standing in line. Within seconds of hearing someone scream “Red Bull!” the car was surrounded. Finally, we were filmed as a group all fired up for the event. A guy in the group behind us got and interview and we were all surrounding him. I’m not sure where those clips are, but I will surely find them somewhere! After the long but fun wait, the doors open and it was a mad dash inside. Everyone was running to get the best seats. We had some friends save seats so we could get in line for autographs. There were four separate lines for different players’ tables. I was only able to get eight out of the seventeen autographs. They were only signing for one hour until the practice started. We were about three rows up from the basketball floor, which are fantastic seats. Basically Hoosier Hysteria was the first basketball practice. They gave player introductions, a 3-point contest, and a dunk contest, all of which were very cool. The night ended with a much-needed trip to Steak n Shake. Everybody was starving because we had not eaten since we had a few mozzarella sticks waiting in line. It was a very fun trip and the campus is beautiful in the Fall. I can’t wait to make a trip back someday. Hopefully someday be able to get tickets to an IU game! This past Saturday I ran in a 5k race that raises funds for prostate cancer. This was their 2nd annual race here in Fort Wayne for the event. I ran the very first race they held here in Fort Wayne last year. That race last year was my very first 5k ever! Fast forward to one year later, here I am again running the same race, only much better. Last year I completed the race in 33 or 34 minutes if I remember correctly. This year I had a goal of finishing before 30 minutes. I came around the last corner to the finish line and gladly saw 28 minutes on the clock. I was super excited and dashed the final few feet to the finish line. My official time was 28:38. That, I guess would be my personal record for a 5k race. I hope they have this race again next year so I can continue this tradition of running a great race while supporting a good cause! Today I received the PT I was expecting! When I first got there, the SGTs did something called a “shark attack”. Basically they gave me a mock-up of what the experience would be like getting off of the bus for the first time at basic training. The SGTs were yelling in your face and telling you to get down and do push-ups, low crawls, and crab walks. I fell into formation and a SGT came around and asked most of us our seven Army values. Being smart, I memorized them the day before knowing that I would have to know them by the end of the day. I was one of the only ones who got them all right and didn’t have to get down and do push-ups. That made me feel good! Next, I did circuit training PT where there were about twelve stations spread out throughout the hallways and drill floor of the armory. Each station was a different exercise. After each time the whistle blew, I ran to the next station to complete the next exercise. When in between exercises I had to jog in place and keep moving the whole time. This was definitely a phenomenal workout. It was very tiring. After a final whistle blew, the whole company gathered on the drill floor and ran laps yelling and getting pumped up. HOOAH! That was definitely a cool experience. After PT I got a nice shower that was surely needed. The rest of the day was classroom activities based more on suicide prevention, sexual harassment, and my favorite taught by Sgt. Jimenez, resilience. For chow, (lunch or dinner) I had Quiznos that was brought in. As a soldier, they feed you very well! After that was more classwork. Our class got smoked (getting down and doing push-ups and other exercises) badly because one of the recruits didn’t have the materials he was asked to have on him at all times. I can feel like that is going to be old news during basic training. That was pretty much my whole second day of Red Phase RSD. There are three phases of RSD: red, white, and blue, respectively. Next month I will be on to white phase. I am really enjoying myself being involved with something that is way bigger than myself. I am determined to work hard and be the best soldier that I can be. This RSD drill happens for one weekend every month before I ship for Basic Training for the National Guard. I have a total of four RSD drills before I ship. Today was the first day of the first RSD drill I have completed. It was everything I expected, but I thought there was going to be more physical training the first day. I checked in and started our first PT test. For the very first time it is a 1-1-1 format: the most push-ups in one minute, the most sit-ups in one minute, and a timed one mile run. I was not counting how many push-ups and sit ups I did, but I know there is plenty room for improvement. I got 7:58 on my timed one mile run. An 8:30 is required for my age, but I still want to improve this time as well. On the way to the running location, we marched in formation and “sang” out cadence calls. I think that is one very cool thing about marching. There are some platoons that have excellent cadence callers and the SSGT that was calling ours was certainly awesome. After my PT test, I got a literal one minute shower and got dressed into civilian clothes. Usually after PT, I would dress in ACU’s (Army Combat Uniform) but a lot of the new soldiers alongside of me are not issued them yet due to the defense budget just being passed. The money hasn’t arrived in the Battalion’s account to order new uniforms and other things of that matter. After dressed, I was informed to get a haircut. So boom, just shaved off all the hair with just specks left upon the top. I continued to head to the classroom where I spent a good amount of time going over technicalities and rules of the Guard. I also learned about the different rankings within the Army and throughout different divisions. I also learned the signs of someone who might be planning to commit suicide and ways to prevent it. Next, I headed outside to learn several different forms of warm-up exercises. After that I had more classroom work and mainly talked about what the BCT (Basic Training) experience was going to be like. I went back outside for DNC (Drill and Ceremony) instructions. This is where I learned to stand in formation with a platoon. There were many different ways to stand in formation such as: at attention, parade rest, stand at ease, at ease, and rest. I also learned how to fall out and into formation. Marching in formation was another thing that I learned. Also the well-known commands such as right-face, left-face, and about-face, as well as column right and left which turns the direction of the whole platoon while marching. It was fairly cold outside throughout the day. The SSGT asked if we were cold and one person said yes. So we all got down and did push-ups and flutter kicks over and over. When the SSGT asked again if we were still cold, someone still said yes. And down again we went. After the third time that person finally caught on. Overall it was a great first day and I am looking forward to tomorrow’s day of drill for this month! Last weekend, I participated in my first half-marathon race in Fort Wayne with the Fort4Fitness event. I registered with a couple of friends of mine and we were determined to complete the whole thing starting together and finishing together. At first, I was not sure if I was going to be able to run the whole thing, which was my goal. I did a great job throughout. I would have easily been able to run the whole thing. The two other friends of mine, however, didn’t seem to be as prepared as I was. Near the end, their legs started to give out on them and we walked most of the end of the race. We completed with a time of 2:42:39. It felt so great after the race. We got a medal and a bunch snacks at the finish line. After the experience, it made me want to run another half-marathon right away! It was so much fun with all of the people alongside of you completing this awesome goal as well. I have been experiencing some knee pain still a week later after the race, but it seems to be healing alright and feeling better. I can’t wait until the next time I will be able to run a half-marathon race. I have a time to beat! I was picking my sister up from school one day and saw my old tennis team out playing on the courts having a match against another school. I went over there to see if my old coach was still around. He was still coaching the team, but wasn’t there that day due to a doctor’s appointment of some sort. Anyway, a guy I played with my junior year on the team is volunteering this year to be the assistant coach. I saw him and told him, “Yeah, I am better than I used to be and I miss being on a team.” Which is true, definitely. He also goes to IPFW and I have seen him around a few times. He asked if I was playing intramural tennis, and I was not…yet. I wanted to play earlier on in the year, but could not find any people who wanted to form a team. Turns out that he was looking for another guy to play with on his team. I gladly accepted the invitation! Our team plays on Mondays and Tuesdays against four other teams. So far we have played three of these teams and beat them all, not losing a single match. A team consists of four players: two people to play singles and a doubles team. I have played in the number 2 singles position every time now. Our team name is “The Fort’s Finest”. I find this name very fitting. I am probably the weakest player on my team, but we are all pretty good. We all get free t-shirts out of it, so that is a plus! It is so awesome to get out to play tennis with a group of people who love to do the same thing. It feels great to be on some sort of team sport again. During our matches we are all encouraging each other from our own court yelling out motivational things and whatnot. Two of my first three matches have been hard-fought. I like a good challenge when it comes to tennis. Tennis is something that I would love to continue playing throughout my life. On September 23, I went to my first NFL game! 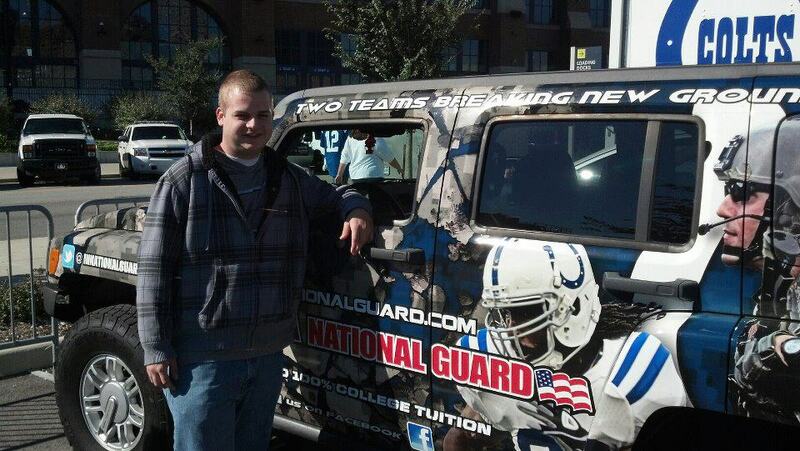 I got the opportunity to go to this game through the National Guard. 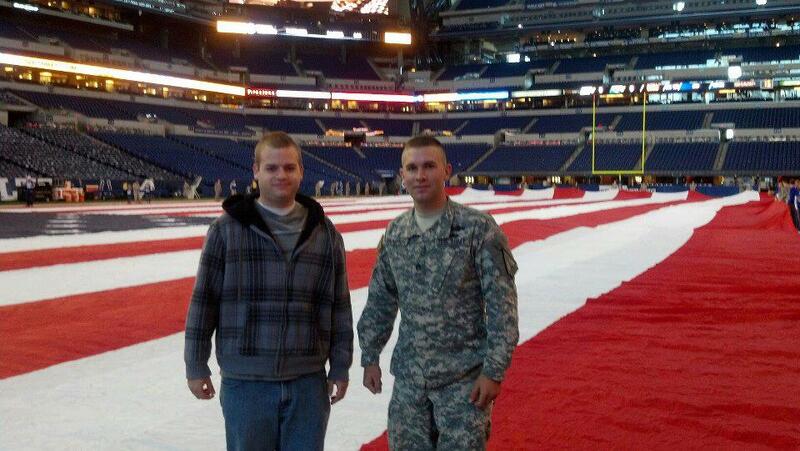 They ask soldiers to go to Indy to help with flag detail at the beginning of the game. Flag detail is when they have a huge, field-sized, American flag stretched out across the field during the national anthem. In return, they would give us a free meal and free tickets to the game! The opened up the stadium roof and side panels! I woke up around 5am that morning to meet up with a couple of sergeants at the armory to make the trip down to Indianapolis. On the way down we had a little extra time to kill and stopped for breakfast at McDonald’s. Eventually we found parking and made our way to the stadium. I never knew how big the stadium was until I walked right up next to it. Of course you can see the massive building from the highway, but that doesn’t do it justice. We waited around a bit before they took us to the field to practice. The flag was already stretched out and we picked it up and practiced waving it and scooping it up in a timely manner. This huge line would form when we picked up the flag and carried it off the field. After practice, they gave us some time to walk around the stadium, go to the pro shop gift store, and head out to the tailgate area. Our armory drove down their national guard hummer and in the back they had a Xbox set up with Madden in the system. We hung outside for a little while until it was time to go back to the stadium to do the actual thing before thousands of people in the stadium. 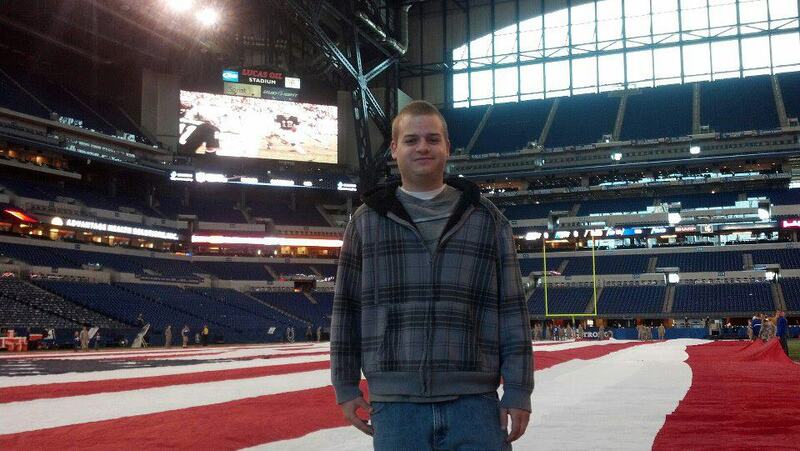 On the field with the flag stretched across! We picked up the flag and walked out to the sideline. The players were being introduced as they ran out of their respected tunnels. It was so awesome to be right down on the field for that. I was holding one of the shorter sides of the flag, so I was standing in the end zone when some players came running right towards me to take a knee in the end zone right behind me. National cameras and photographers all around me getting the best pictures of the big athletes. The national anthem was sung right behind me as I held a part of that flag. It was a crazy awesome experience that I will never forget. This is Sgt. Thompson, my recruiter, and I. After the flag responsibility was over, we got our tickets and found our seats to enjoy the game. It was very different from watching NFL on television. 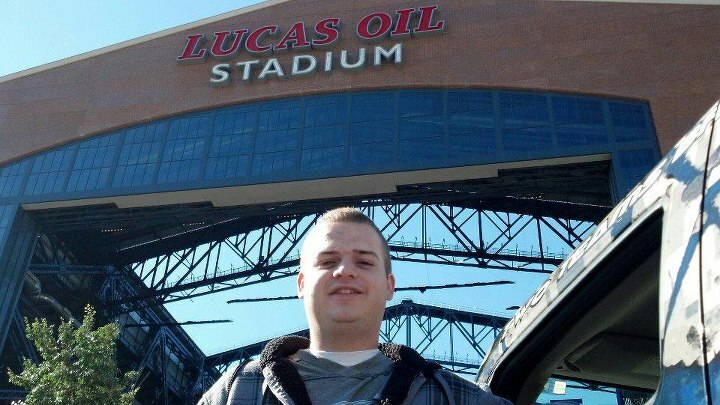 There were two huge jumbotrons at Lucas Oil. The Colts ended up losing a tough fought game, but overall the time I had, was priceless! This was something to cross off of my Bucket List!